All middle school, high school, college and graduate students are invited to use this rate. Compassion is part of our innate nature and basic goodness. Accessing its full potential and power is at the heart of the spiritual path. This evening's talk will address the possibility of a healthy relationship with this ultimate resource of an altruistic life. Presented by DGCEC, in partnership with the Center for Interfaith Relations, the Dharmata Foundation, and Mangala Shri Bhuti. 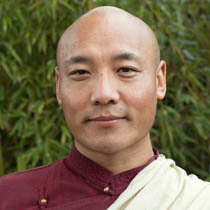 Elizabeth Mattis Namgyel has studied and practiced the buddhadharma for 25 years under the guidance of her teacher and husband, Dzigar Kongtrul Rinpoche. She has been intimately involved with Rinpoche's work in bringing Buddhist wisdom to the West, in particular to the development of Mangala Shri Bhuti, an organization dedicated to the study and practice of the Longchen Nyingtik lineage. 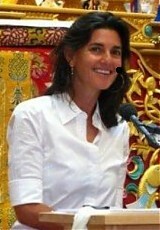 She is the retreat master of Samten Ling in Crestone, CO, and teaches throughout the U.S. and Europe.